The unit step function (also known as the Heaviside function) is a discontinuous function whose value is zero for negative arguments and one for positive arguments. The Heaviside function is the integral of the Dirac delta function. Our current intention is not to deal with all the formal details. In this brief article we're going to deal with it in an informal way, in order to just operate with it and create some plots in Matlab. This function is commonly utilized in control theory or digital signal processing (dsp) to represent a signal that switches on at a specified time and remains switched on indefinitely. The function depends on real input parameters. We can define the function having a scalar number as an input. For example, let’s create a discrete plot without using any special toolbox in Matlab. If we want to get a plot from there, we have to iterate utilizing real numbers. If the input is an integer, then the function will be a discrete one. To stress the fact that we're working with discrete functions here, we'll use 'stem' instead of 'plot'. We don’t need a loop now, so our process has been simplified a lot. Let's use this new approach. We can see that every integer in the domain of the function counts to add to the final result, and that happens when the argument is zero for each term. 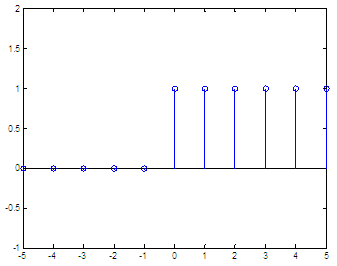 The first term, 4H(n), adds a height of 4 (coefficient) at n = 0; the second term, 3H(n-2), adds a magnitude of 3 at n = 2.